King County Executive Dow Constantine today joined Superior Court Presiding Judge Susan Craighead and members of the King County Council to announce members of a steering committee charged with recommending solutions to a growing racial disparity in the regional juvenile justice system. It is the largest and most diverse group King County has ever assembled to act on juvenile justice issues. Among the members of the Juvenile Justice Equity Steering Committee are parents, youth, mental-health and grassroots leaders. They are teaming up with the heads of school districts, law enforcement agencies and courts from across the County, including Seattle Police Department Chief Kathleen O’Toole, Highline Public Schools Superintendent Susan Enfield, and Juvenile Court Judge Wesley Saint Clair. The panel includes youth who have experienced juvenile detention themselves, youth mentors, a foster parent and community-based advocates fighting to dismantle the school-to-prison pipeline by increasing effective alternatives to school suspensions and youth detention. Although King County’s youth detention rates have dropped more than 60 percent over the last decade, the proportion of youth of color in detention continues to rise. While only a tenth of the county’s youth population is black, they almost made up half of the youth detention population last year. 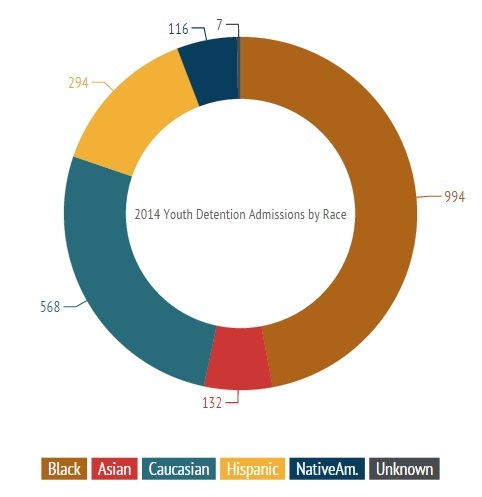 About three quarters of the overall 2014 detention population were non-white youth. We can end the inequities that lead to youth of color being over-represented in our juvenile justice system. I thank the community members who have agreed to be part of this important work, and encourage everyone to learn about and engage in these efforts. For more information and updates on King County’s efforts to reduce its youth detention population, contact Alexa Vaughn at 206-477-9463 or Alexa.Vaughn@kingcounty.gov.